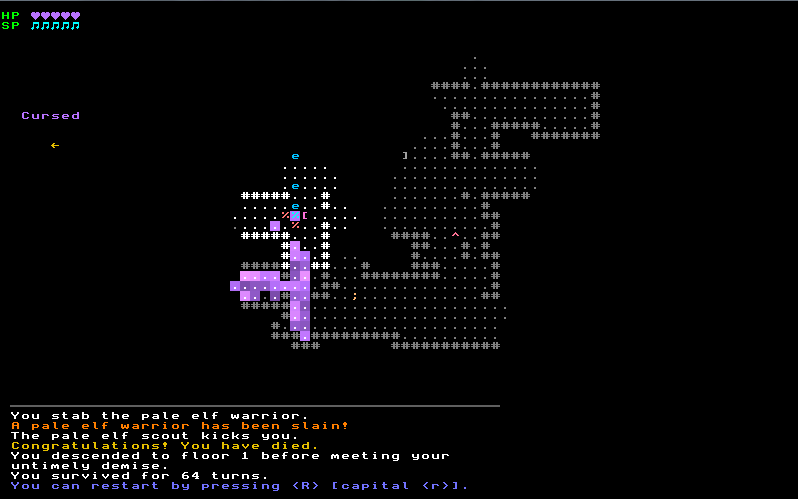 Lost Valkyrie is my entry to the 7DRL 2015 Challenge. The key concept of the game is the player's attack range. You can perform lunging attacks (2 tiles) or throw your spear (across the screen! ), but you'll have to retrieve it. Andrew Wright, developer of Dead Man Walking, Android Loves Kitty, Grid, Iron Fist, and Lost Valkyrie. This is my development blog! Excellent game! The controls are nice and simple. I like that the items all seem to have unique properties which are hinted at by their name but not outright explained, and that you have to choose between them on the spot rather than hoarding a bunch in an inventory. I think the throw direction indicator could use being labelled as such. One odd item glyph though, the hats (?) look like traps! I very like this game. Simple but nice/interesting mechanics, simple but nice visual, simple but nice everything. It reminds mi roguelikes by Jeff Lait and ZenoRogue. But I have one question. I don't know that this is bug or feature, but sometimes after throwing spear I cannot retrive weapon, it disappear. Thanks for the kind words! I'm glad you both enjoy the game. That sounds like it's a weird bug, but there is an item that allows you to swap places with an enemy when you hit them. If you have that item when you throw your spear you'll automatically pick it back up. If that's not what's happening, then it's most likely a bug. I just got back in session at university, but I'll try to look into that and some general polish fixes this weekend. I think the throw direction indicator could use being labelled as such. One odd item glyph though, the hats (?) look like traps! The directional indicator is overall the thing I'm least satisfied with in the UI. A label would have been a good addition! Hats as traps - not sure how I didn't realize that! Guess the only saving grace is that there are, in fact, no traps. Yea, it's pretty broken. It's a balance issue I hadn't really noticed until there were only a few hours left. My band-aid fix of choice was to just prevent the player from getting chain-frozen. If I release an expanded version, I'll likely apply those same rules to enemies. Oh yeah, and in one of my playthroughs I learned the song of storms, and the projectiles it spawned wouldn't explode or anything. Then I picked up a new item, I think it was the eldritch belt and I dropped the jotun's belt or whatever its name is, and my old projectiles went off all at once, bringing the game to a cacophonous halt for like a full minute. That's weird. Sorry to hear it. Sounds like the explosives are getting frozen by the belt somehow. Nice game, but it lacks some visual feedback on actions of enemies. Especially explosions. Sometimes I don't really know what killed me. Hi folks, sorry for the delays. University just started again for me and it's been a busy couple weeks. Looks like you were cursed and the mystic frog killed you in that image. They can attack from 2-tiles away. You can tell you're cursed when your hearts are purple and you have the Cursed thing on the side. Being Cursed basically just means anything will kill you in one hit. Thanks for the crash report. I have some free time this weekend and I'll try to look into it. Looks like a fairly simple issue.